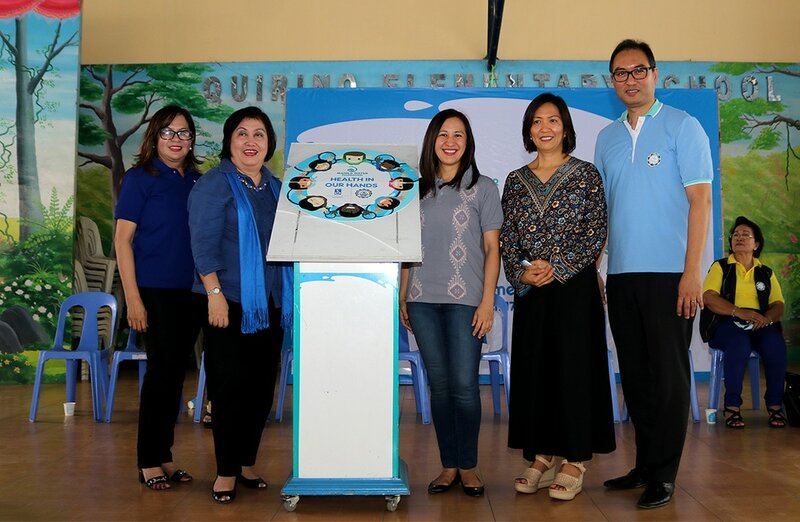 Manila Water Foundation formally launched its “Health in Our Hands” at an event recently conducted at Quirino Elementary School.. The event also served as the formalization of MWF’s partnership with Soroptimist International of Congressional who donated a handwashing facility for the school. In this photo are (L-R) Soroptimist International of Congressional President Judy Gutierrez, Soroptomist International of the Philippines Governor Maria Rosario Tumaneng, Quezon City Vice Mayor Joy Belmonte, Quirino Elementary School Principal Maricris Santos and Manila Water Foundation President Ferdinand Dela Cruz. To further its commitment to promote handwashing and hygiene to Filipino children and those involved in shaping their lifestyle, Manila Water Foundation (MWF) has recently piloted a new program called “Health in Our Hands” at the Quirino Elementary School in Anonas, Quezon City. This new program under MWF’s water education focus area seeks to reinforce the importance of proper hygiene in keeping one’s health via year-round campaigns in schools and communities. The inaugural event, which was attended by more than 300 pupils and teachers, discussed how proper hygiene should start from the human hands. Through an interactive lecture, participants learned about the seven steps of proper handwashing and the key moments when these should be practiced. Aside from the lecture, a hand painting and handwashing ceremony was also conducted to express everyone’s pledge to take on a more active role in achieving proper hygiene. After the handwashing session, students also pledged their commitment by sticking hand stickers in the event’s pledge wall. His statement was bolstered by the Soroptimist International (SI) of the Philippines Governor Maria Tumaneng Rosario who reiterated their organization’s mission and imparted, on the other hand, the importance of supporting such programs with facilities which can empower children. “Our theme for this millennium is to educate and train women and girls to access and conserve clean and safe water. This is supported by our tagline which is ‘Water is wealth for women.’ Thus, we are thankful to be partners with Manila Water Foundation because we share the same advocacy of providing water. Aside from that, we are also [committed to] take care of children and this facility is really a gift for them. This is the first school where we built a handwashing facility because we believe that the best way to touch lives is through water,” she shared. SI, through its Congressional Club, donated a handwashing facility to the school after deciding to tap MWF’s water education program to help ensure that the donation will also be instrumental in the effort to achieve better health for the students. The inauguration of the facility, which will benefit nearly 3,000 pupils, teachers, and staff, served as the culmination for the day’s event. To ensure that the engagement will continue even after the event, information education and communication materials were also given away to all participants along with the book donation from Scholastic. With this, Quirino Elementary School Principal Maricris Santos expressed a heartfelt thanks to the proponents of the activity. MWF’s year-round campaign will be brought to several more schools in key locations in Metro Manila in the coming months. To create an even bigger impact, MWF is also looking into the possibility of conducting the same engagement in other schools adopted by Soroptimist International of Congressional.